We’re back for your Thursday ahead of an almighty UFC 234 with some more #KiwiUFC content. Today’s little stat check is of Israel Adesanya, with his last two fights against Brad Tavares and Derek Brunson. 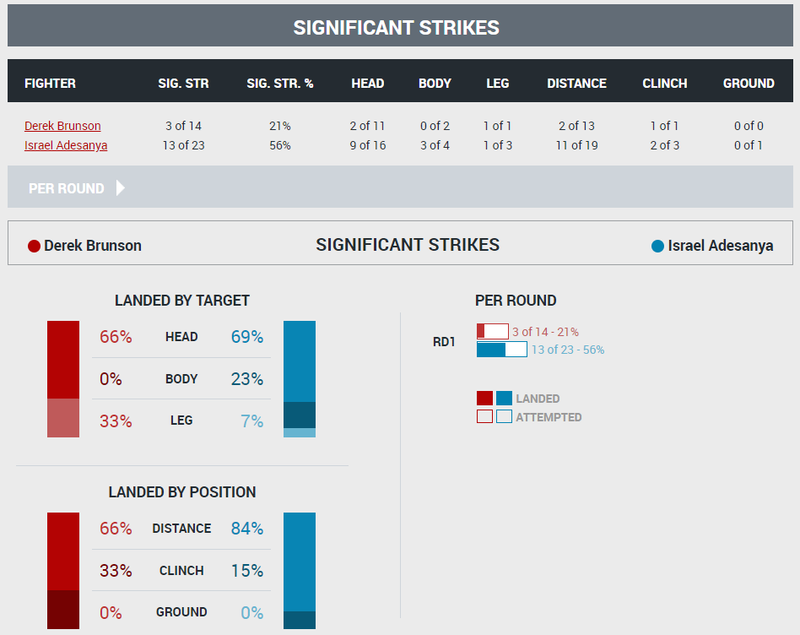 There wasn’t much to the Brunson fight other than Adesanya picking him apart, but the funk again lies in takedown defence which is eerily similar to the Robert Whittaker stats I highlighted on Tuesday. Tavares scored 1 of 12 takedowns and Brunson 0 of 7, that amounts to 1 of 19 takedowns across the two fights. Adesanya is a striker and if you main weapons are a variety of strikes, you have to be able to either avoid or snuff takedown attempts consistently. That’s exactly the case for Whittaker, who doesn’t quite have the variety and pizzazz in the striking department as Adesanya, but Whittaker does have a strong wrestling base to work from. Adesanya showed against Brunson that he’s got the defensive tools to dictate fights and if Anderson Silva hopes to go down any non-striking route (which would be weird), Adesanya has proven himself capable of handling those attempts. Adesanya has 85% takedown defence across his career and also the low key funky 71% significant striking defence.